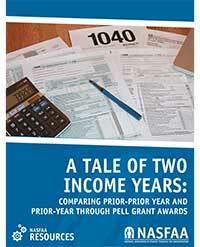 Through a grant from the Bill & Melinda Gates Foundation, NASFAA analyzed more than 70,000 student records from five years of data to determine whether the use of prior-prior year (PPY) income data in place of prior-year (PY) income data would impact student aid eligibility -- and specifically whether Pell Grant awards would change with a move to PPY. Each year, students must submit a Free Application for Federal Student Aid (FAFSA) to be considered for federal grants, loans, and work-study. Timing is critical when submitting the form, because the FAFSA depends heavily on the latest income information submitted via income tax returns. Under the current structure, delays can cause an unfavorable chain reaction: a delay in completing the income tax return can mean a delay in submitting the FAFSA, which can result in a delay in financial aid notification—and possibly a reduced amount of financial aid. This occurs because some forms of financial aid have a limited pot of funds, which is distributed on a first-come, first-served basis. Receive notification of financial aid packages earlier. What differences are there in using PY income versus PPY income when calculating family contribution toward college, and how would this affect Pell Grant awards? Would students from different institution types and with different family circumstances and/or financial backgrounds be affected differently by a switch from PY to PPY? The study showed that dependent students from very low-income families and independent students with dependents of their own (two of the neediest cohorts) could be ideal candidates for PPY because even some income variability from year to year does not affect their aid eligibility. The report also outlines ways to mitigate negative consequences for students who would not fare as well under a move to PPY, such as proactively identifying these groups early on, and exploring unique ways to streamline the professional judgment (PJ) process.